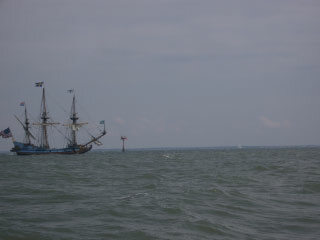 Is Johnny Depp on Delaware Bay? 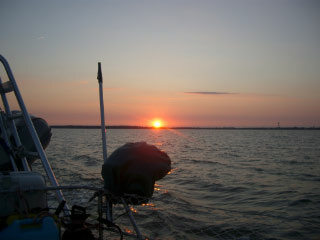 5:30AM We leave the anchorage before dawn for another long day. Our exit in darkness is a little more graceful than Atlantic Highlands with no stuck anchors or night-blindness. 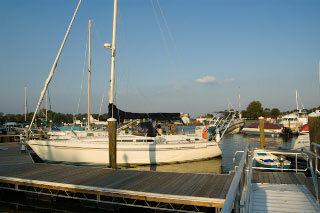 Today we’ll head up Delaware Bay and go almost all the way across the C&D Canal which connects the Chesapeake and Delaware Bays – 65 miles. 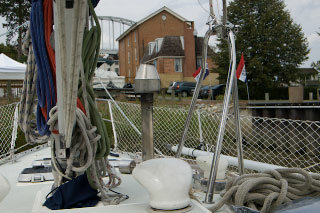 We leave Cape May through the Cape May Canal and get our first chance to test my measurement of our mast height. In the darkness we approach a bridge with 55’ clearance. 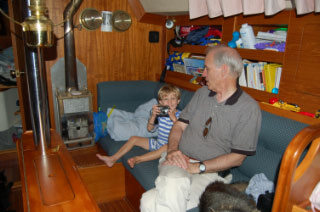 From measurements made during my first and only trip up the mast in the bosun’s chair to mount the top of the SSB antenna, I believe the tip top of the VHF antenna to be 54’8” above the waterline (but like a car antenna it can flex if necessary). I believe 52’4” is the highest rigid point, the tri-color light. I slow Grace to almost a full stop and drift very slowly toward the bridge. Megan is on the foredeck watching and ready to call for full reverse. From my vantage point, it surely is going to hit. I listen for the VHF antenna to bounce along the underside… nothing. We’re through! 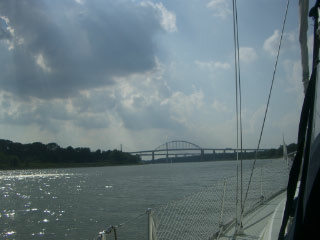 Out of the canal and into the Delaware. The wind is light and almost dead astern. 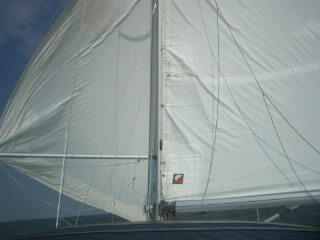 I decide this is a good day to try using our whisker pole to keep our headsail full. After one failed attempt to deploy it to the wrong side, I get the pole up. Wing-on-wing with the pole keeping the sail full! Megan reports from the helm that we’re picking up speed. Soon the wind is picking up and a strong current is kicking in. The GPS will record over 11 knots speed over ground. Our speed though the water reaches hull speed. As the boat surfs down the face of the swells, we feel it shudder. We’re flying! But we get passed! Who but Calypso should come up behind us. I don’t feel so bad when I see that they their engine is running. We’ve never gone faster. I see no need to spend money on diesel today. The 45 miles up the Delaware goes by in no time. We get to the head of the bay and round a point marked by a huge power plant. All of a sudden the excitement of our speed becomes fright. Due to lots ship traffic (barges, freighters, a ferry and a boat in tow) we have to change course. Rounding the point, the wind increases and we get the double-whammy of the apparent wind effect. When the wind was behind us it felt like only 7-8 knots. But combined with our 11 knots of boat speed the wind is really closer to 20 knots. And rounding the point, the true wind increases to over 25 knots blowing perpendicular to the waves. This is the most “serious” things have gotten so far on trip. We now have a full main and a full genoa with the whisker pole up and over 25 knots abeam. We have never doused the whisker pole before and can’t turn into to wind to figure out how to do it. The seas would be hitting us broadside and it would put us in the path of ship traffic. We have to hold course and hang on for a wild ride heeled over and running FAST. Finn is in the cockpit with us strapped in. He doesn’t appear to be scared but is definitely quieter than usual sensing the tension dripping off Megan and me. 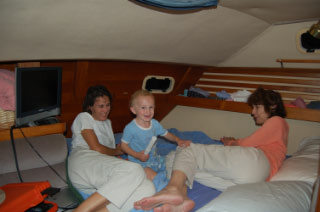 After passing the last of the ship traffic, and getting into calmer waters past the point, Megan is able to hold us into the wind while I go to the foredeck to bring in the whisker pole. It’s not pretty but we get it down and re-establish control. Megan later comments it was like being in surgery. Sometimes things get tough and you just want to be somewhere else but you know you can’t. You just have to buckle down and get through it. It was a trying time but we kept our heads, kept our cool with each other, and worked through it together. It is a tangible demonstration of trust and confidence in each other. Since we’re nearly at the mouth of the C&D Canal when we get the pole down, the situation immediately changes. Soon we’re motoring down a protected canal. 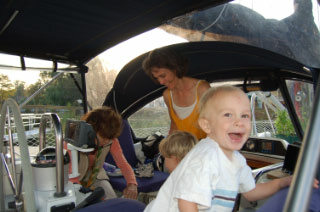 Finn & Teague are now both in the cockpit and waving at the boats we pass or are passed by. At 3:15 PM we turn into Chesapeake City and manage to barely squeeze into one of the free slips the town has just installed for transient cruisers. 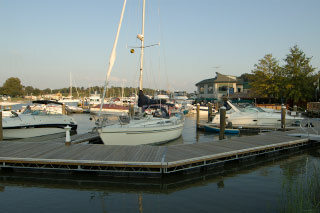 They are so new that no one knows about them yet (we do because our friend Michael Hoff sailed through a week earlier). We’re quite pleased to be there since the anchorage is jam packed and a weather front is expected this evening. Just as I’m securing the dock lines, my phone rings. It’s Uncle Muckle and Granny. 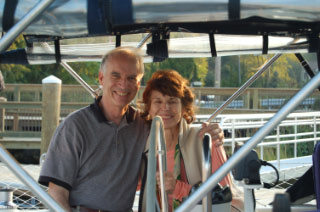 They’re heading back from Washington DC, are passing through Chesapeake City and ask if we’re anywhere nearby! What a great surprise! 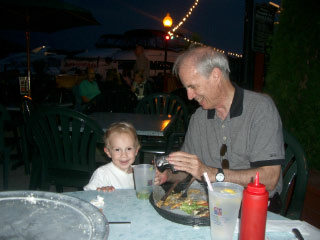 They treat us to a very nice dinner out and we manage to convince them to stay onboard for the night. As we’re tucking in for the night, the radio reports that the weather front that was predicted is now a TORNADO watch! I frantically double up the docklines and run a spider web of lines everywhere. The wind kicks up to 25 knots and rain begins to downpour while I’m tying off. I’m not so sure I like Grace being this close to solid objects with this forecast. And then it’s over. The storms miss us and the rest of the night is uneventful.